Here is a book for anyone interested in the beliefs and rituals of the world's major religions. 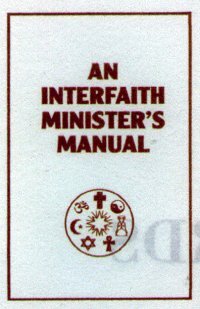 An Interfaith Minister's Manual is the only book gathering ceremonies from the world's major religions into one volume. There are listings of Jewish, Islamic, Buddhist and Christian feast days and a glossary of religious symbols and what they mean to different faiths. There are complete scripts for performing Baptisms, Confirmations, Marriages, Anointing of the sick, Funerals and Memorial services (including a funeral for animals), and for the ordination of ministers. There are chapters on candlelighting services, healing and meditation, blessings and exorcisms of people, buildings and things. Finally, there is a chapter of Prayers for all occasions. The book is a beautiful hardback with a choice of black or white cover and gold printing. 336 pages.